It is easy sometimes to forget just how long safety nets have been in use in the UK. In a very short period of time, safety nets have become almost as common as safety boots and hard hats. 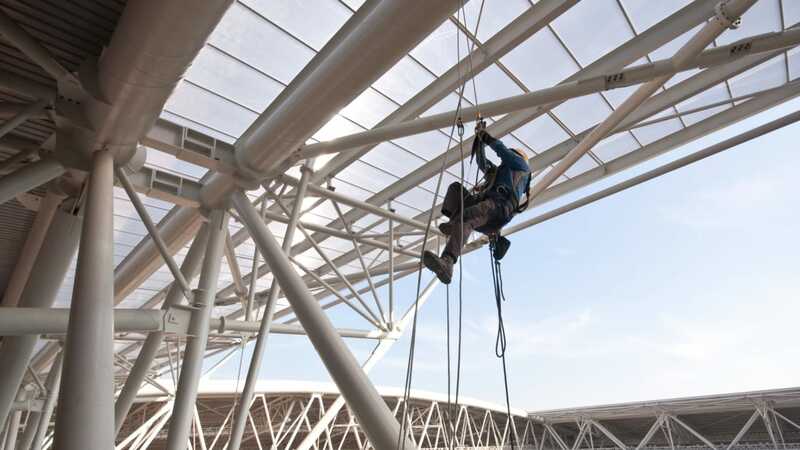 There is no doubt they are playing a significant role in providing a safer working environment for those working at height - typically industrial roof cladders and floor deckers. 1998 saw the first safety nets installed to any reasonable level of competency, so we are now in year seven, in an industry where other trades are decades or even centuries old. Reported incidents where safety nets were used in anger totalled 45 in year two - it would be reasonable to double that number to include unreported incidents. When considering safety nets alongside these other trades, it would be fair to say that safety nets are still in their embryonic stage. It would also be fair to say that there is still a lot the industry has to learn about itself. What exactly are safety nets? Quite simply, safety nets are suspended directly below the working platform from where an individual at work may fall. They are engineered to reduce the loads on both the faller and the structure to which the safety net system is attached. They minimise the height and consequences of a fall by provide a soft landing for the faller by stretching in a controlled way, thus minimising injury. There are two primary reasons why safety nets have proved to be so successful in such a short period of time; firstly, they offer collective protection which is one of the options in the proposed Work at Height Regulations. For example, nets, barriers and guard rails provide collective protection and are normally installed by a competent specialist who should handover safe areas when complete. This means that once a system has been installed and handed over in this controlled way, then everyone operating at height in the area is protected. By using this specialist, principle contractors can manage quality control procedures before work commences, satisfying themselves that the specialist is indeed a specialist. This can be controlled by pre-contract documents and meetings where safety can be planned and importantly the needs of the beneficiary (the worker at height) and safety solution providers can be coordinated. Secondly, safety nets provide passive protection which means the individual operating in a hazardous area does not have to do anything personally to be safe. For example, a roof worker using a harness is not safe to work at height until he puts the harness on. He also needs to ensure the harness has been inspected and recorded within the last three months and has not suffered damage during normal use which may affect its performance in the event of a fall. Those managing this individual should have provided appropriate training and put measures in place to ensure the harness is used properly. A question which is seldom addressed (perhaps ignored) is "what is the roofer going to attach his lanyard to? ", and is he competent to make an assessment as to what is or isn’t a reliable anchorage point. The use of harnesses minimise the consequences of a fall, they don’t minimise the height at which a person may fall. As with any new trade in any industry, there are those who do it right and those who don’t - the latter benefiting from high prices in early market conditions - often at the expense of the uninformed potential beneficiary of the system. In the early days of safety nets, rigging courses were made available, but with varying degrees of instruction, understanding and assessment. Individuals could choose to attend a two day course which included theory sessions based on EN 1263/1&2, practical work from MEWPs and a written test supported by a practical assessment to confirm the trainees understanding and aptitude. Some courses offered a period of on the job work and site assessment before competency cards would be issued. At the other end of the scale, an individual could pay considerably less for a 1⁄2 day course and still obtain a competency card. The inevitable question arose; how could the safe gate keeper recognise a card that offered genuine confirmation of an individual’s competence? He may be confronted with two individuals with competency cards from two different training providers - which one should he accept? He has after all, a duty of care to ensure those working on his site are competent to carry out the required task. It would be reasonable to suggest that the biggest threat to the safety netting industry was its own uncontrolled success. It was only a question of time before the inconsistency in training led to a serious error of judgment. Alongside the issue of training and competency was the interpretation of standards, good practice and the need for a focal point to where questions and issues could be directed. New rigging questions were arising as more safety nets were installed. It certainly became evident that the emerging industry needed a voice through which issues could be discussed and communicated. The HSE were keen to identify with an industry body with whom they could work, preferring industry involvement rather than prescriptive measures. This is where FASET (Fall Arrest Safety Equipment Training) came in. A handful of manufacturers, specialist installers, training providers and the CITB (Construction Industry Training Board) met to agree a way forward that provided the market with a recognised training scheme and a structure through which industry issues could be discussed, resolved and communicated to the wider audience - many of whom would be the ultimate beneficiaries of a safety net system. The whole project was fully supported by the HSE who saw the need for such a body. Intentionally, those forming FASET chose not to restrict the body to just safety nets. The future of such a body could include other areas of work at height. After all, there are many mutual areas of interest and subject areas to cover in training: legislation, principles of working at height and work activities which would create common risks. This could then create a universal umbrella brand through which users of work at height products and services could identify and measure competence. The CITB’s involvement was crucial to helping plan the training agenda - particularly as the end game was evidence of competency. The CITB also brought the experience of administering competence card schemes within the construction industry to the table. It ensured the end game allowed for a seamless move into the NVQ framework. Three training schemes were devised by the founder members ensuring a wealth of experience was funnelled in one direction for the benefit of the industry. Under the FASET banner any commercial bias was easily removed which meant that FASET training courses were entirely factual, based on legislation, standards, health and safety law and industry best practice. For those wishing to install industrial safety nets, the Safety Net Rigger General Syllabus was developed covering safe working at height, legislation, safety net technology, rigging principles and techniques, attachment points and inspection of safety nets. Specific sections on care and storage, examination, use in anger and recovery ensured trainees fully understood all component parts of a safety net system. The training course restricts the number of candidates to 6 trainees per course. This low trainee to pupil ratio allows delegates to learn quickly and efficiently. Importantly, a written test and practical assessment was designed to confirm the delegates understanding. The conclusion to the one day training is the issue of a Certificate of Attendance. These certificates of attendance do not confirm competence (this follows a separate assessment after a period of time on site). Up until August 2004 the CITB issued a FASET/CITB card to confirm competence (following an on-site assessment). This was replaced by a CSCS Safety Net Rigger card (existing FASET card holders have until the end of June to transfer their old FASET card to the new CSCS card). For the house building industry, a separate syllabus was put together to deal with the installation of safety nets offering protection during roof construction. The Housebuild course is intensive and practical, supported by theory, covering common Housebuild variations. Again, a written test confirms delegates understanding and contributes to the issue of a FASET/CITB Housebuild riggers card. The majority of the course is practical exposure to net rigging. Delegates undergo one to one and group tuition and the conclusion of the course is an unsupported delegate rig where practical skills are assessed. For both rigging courses, an up to date touch screen site safety qualification will be required. The final piece in the training jig saw was the need to help the safety gate keeper understand what should be expected of a competent rigger. A safety net inspector course gives health and safety managers/inspectors, site managers, project managers and site supervisors the knowledge to identify good and bad rigging and, where appropriate, the information to make constructive comment. Typically, FASET trainers deliver this course to principle contractors. All courses are supported by written documentation, which is provided to all trainees, which run in tandem with the course syllabus. FASET has now been up and running for the last 4 years and is recognised as the body for safety nets. Its training and assessment programme gives the safe gate keeper the means by which he can measure the competency of the individual who turns up to install safety nets. When he asks for evidence of competence, he now has an easily identifiable competence card, recognised by the industry and authorities. The second function of FASET is to encourage companies to join FASET as members. This involves a thorough audit to ensure they meet performance requirements which ultimately prove they operate in a responsible way; insurance, training, safety, equipment management and rigging standards. The benefit to members is that they can take an active role in industry issues and contribute to maintaining high standards. The benefit to the safety gate keeper is that a member company offering installation services has demonstrated to a third party (the industry body) that it operates in a responsible and proper manner - in other words reassurance that they not only do the work properly, but they have important behind the scenes support e.g. health and safety management for each job and a maintenance regime which ensures nets will perform as intended. FASET currently has 30 members. The third function of FASET is to deal with up and coming issues surrounding the use of safety nets. As mentioned earlier, safety nets are found on many construction sites and it is easy to forget how much of a new component they are to UK health and safety. This rapid growth generates many questions and in some cases answers need to be researched, agreed and communicated to a wider audience. FASET has a number of working committees; technical, health & safety and training. Each committee is made up of individuals working within the safety netting industry. Members can join the supporting committees, which means that solutions are based on a broad base of experience and knowledge. For example, the training committee needs to ensure that information passed to trainees is up to date and reflects changes in legislation, standards and industry practice. This is a big task in terms of clarity and communication, involving a number of contributors. The training committee, in liaison with the other active committees within FASET re-write the appropriate sections of the course and training manuals. Currently, the training committee is reviewing the way in which it operates, from selecting trainers and assessors through to delivery and administration. This review will mean that when BS5845 is published, FASET will be working in line with its guidance. FASET is also represented on a number of external committees - all allied to working at height, ensuring the views and net rigging specifics associated with FASET safety net rigging are covered. These include the ACR (Advisory Committee for Roofwork) which is currently drafting a guidance note on the use of safety nets in roofwork and ACWAHT (Advisory Committee for Work at Height Training) - a body made up of specialists offering work at height training where common training standards are being agreed to create a benchmark for subscribing companies. This will ultimately be developed into a stand alone British Standard - BS8454 (Delivery of training and education for work at height and rescue) - again FASET is a key player in this committee. FASET’s growing reputation and weight within the working at height industry meant that it was able to play a significant role in the Work at Height Regulations consultation exercise. FASET has become an influential voice in an industry which needs representation to ensure the reliable performance of systems put in place for worker safety. In a very short period of time, FASET has created an identity which safe gate keepers and the authorities can recognise and rely on. It has provided the industry with a singular voice through which mutual issues are discussed, agreed and communicated as opposed to lots of different answers to different problems confusing the market. It provides a forum for carefully considered responses to issues which may affect the outcome of a life saving system when brought into use. With the model clearly working, FASET is talking to other elements of the fall arrest equipment arena to become an integral part of the body. There are similar issues common to all fall arrest solutions. Remembering that the important role of the safe gate keeper is to seek competency identifying a FASET-trained individual offering a work at height service will make his task easier and therefore more effective. Currently FASET is operating in the UK, and represented in Ireland. Other countries have approached FASET with a view to becoming affiliated or setting up their own organisation which will give even more credence to the organisation. Rob Harris is a founder member and director of FASET. He chairs the training committee and sits on the health and safety committee. He is also General Manager of a safety netting manufacturer and training provider. He can be contacted on +44 (0) 1844 203870.